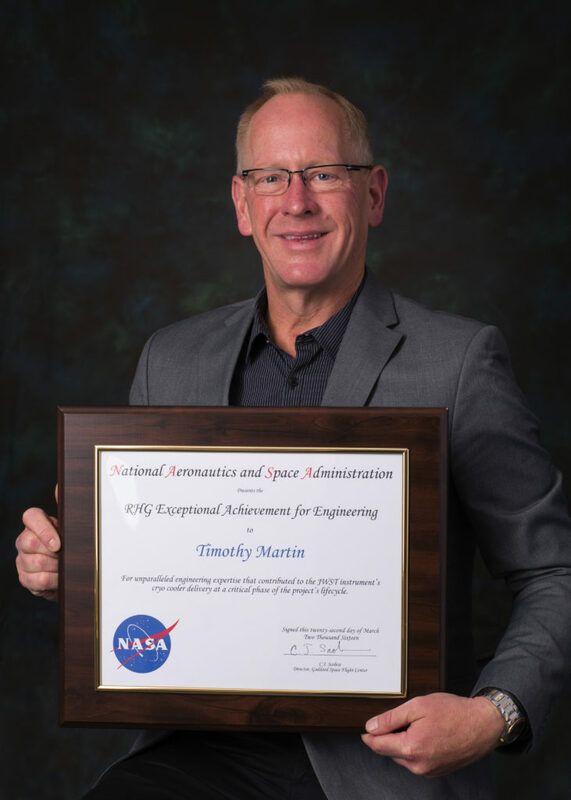 Timothy Martin, director of engineering for Northrop Grumman Corporation’s Aerospace Systems sector was recognized with the Robert H. Goddard Exceptional Achievement Award for Engineering for his work on NASA’s James Webb Space Telescope. Image Credit: Northrop Grumman Corp.
June 13, 2016 – Timothy Martin, director of engineering for Northrop Grumman Corporation’s Aerospace Systems sector was recognized with the Robert H. Goddard Exceptional Achievement Award for Engineering by NASA’s Goddard Space Flight Center. The award was in recognition of Martin’s work on NASA’s James Webb Space Telescope (JWST). Northrop Grumman is under contract to NASA’s Goddard Space Flight Center for JWST and leads the industry team that designs and develops the telescope, its sunshield and spacecraft. The company has completed the integration, testing and delivery of the telescope. Northrop Grumman has a separate contract with NASA’s Jet Propulsion Lab for the Mid-Infrared Instrument (MIRI) Cryocooler, which keeps sensitive instruments at the low temperatures they need to operate. Martin was selected for the award for his technical expertise and leadership of the team that completed the development, testing and delivery of the Webb telescope’s MIRI Cryocooler. MIRI houses a camera and spectrograph, allowing the Webb telescope to view distant objects via infrared light. MIRI’s camera will provide wide-field imaging that will continue and extend to Webb, the breathtaking astrophotography that has made NASA’s Hubble Space Telescope so universally admired. Additionally, MIRI’s spectrograph will provide new physical insights on nearby stars and their planetary systems. In order to see in the infrared wavelength, this instrument must operate at temperatures as low as -447 F. The imperative component, responsible for ensuring the stabilization and operation at such low temperatures is the cryocooler, built by Northrop Grumman. Cryocoolers are usually not much larger than a standard size notebook, but the uniqueness of the MIRI Cryocooler is that it stretches across 30 feet of an observatory with a deployable portion of the structure. A deployable design that stretches across this span at temperatures as low 6 kelvin (or -449 F) has never been accomplished before in the cryocooler field. Furthermore, most cryocoolers stop cooling after 10 years, but this cryocooler is designed to keep cooling the MIRI instrument well beyond 10 years. Martin and his team successfully completed the development, fabrication, integration, testing and delivery of the cryocooler to NASA’s Jet Propulsion Laboratory (JPL) last year, where it has been undergoing cryogenic tests. This June, JPL delivered the cryocooler back to Northrop Grumman’s Space Park Facility in Redondo Beach. This is where the MIRI Cryocooler will be integrated with the Webb telescope’s spacecraft, also developed, manufactured and tested by Northrop Grumman at Space Park. The James Webb Space Telescope is the world’s next-generation space observatory and successor to the Hubble Space Telescope. The largest and most powerful space telescope ever built, the Webb telescope will observe the most distant objects in the universe, provide images of the first galaxies formed and see unexplored planets around distant stars. The Webb telescope is a joint project of NASA, the European Space Agency and the Canadian Space Agency. Ball Aerospace & Technologies Corp. in Boulder, Colorado, is the principal subcontractor to Northrop Grumman for the optical technology and lightweight mirror system and is responsible for the primary, secondary and tertiary mirrors. In addition to 20 optical assemblies, Ball is developing the cryogenic electronics used to align and phase the optics in flight; cryogenic radiator assemblies; wavefront sensing & control software to determine the motions necessary to phase the telescope in flight; and optical system engineering support.